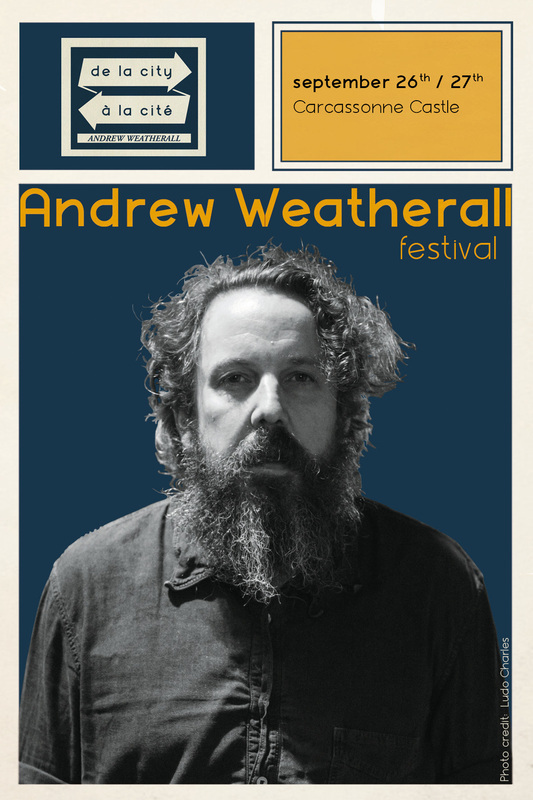 Andrew Weatherall Festival will feature an amalgamation of obscure and underground music from London, Scotland, Bucharest and France, handpicked by the cult icon himself. Featuring: Andrew Weatherall’s Music’s Not For Everyone, ALFOS, Khidja, Scott Fraser, The Liminanas, & The Asphodells. A memorable festival has most of the ingredients that we all demand from the hard-earned nuggets we save for our decadence. Music that shakes us, friends that make us laugh and comestibles to ensure that journey to history is well satisfied. Unfortunately, some of these events leave us in a muddy mire, bedraggled and bereft and bankrupt of bon vive. In early October 2013, organisers Bernie Fabre and Benjamin Esteve came up with the perfect antidote to this. They introduced the Andrew Weatherall Festival to the idyllic surroundings of Carcassonne, in The South Of France. Set inside beautiful medieval castle walls in Le Bar a Vins, La Cite hosted the infamous Scrutton Street Axis and the early adopters left with memories, friends and beautiful architecture they will never forget. This year, the Andrew Weatherall Festival is trumping last year’s unexpected poker hand by hosting another two day festival, this time in the magical Le Chateau Comtal. “The Count’s Castle”, a UNESCO World Heritage Site, will provide a stunning, historical stage curtain to some of the best musical, left field talent from across Europe. Andrew Weatherall. Fondly called “The Guvnor” due to his immense and immersive knowledge and history in British dance culture. His dubbed-out, space-rocked and cosmic-danced ears have lent an off the page remix to everyone since Adam. He once again has hand-picked acts and DJ’s that exemplify his hunger to encompass exciting talent from across the world. Happily once again, Andrew is joined by his Scrutton accomplices in several different guises. Braw Glaswegian Scott Fraser will be playing a mix of tracks from his recent outings on Crimes Of The Future (also a fantastic night out with title inspired by the other master of dark arts Cronenberg) amongst other recent tracks, and a passion for early street techno and some NY breaks which has seen him and Timothy J. FairPlay tour The USA recently and provide one of the best mixes of the year on Beats In Space. “Rolling snare” hater, psychedelic producer and analog geek Timothy J. Fairplay will be joining Andrew for a The Asphodells DJ set. Their album gave listeners a retake on their Kraut and Factory Record influences, with signature baselines Hooky would be proud of. The subsequent remix album was a call to arms for some of the best producers, with Daniel Avery, Justin Robertson, Phil Kieran, Baldelli & Rocca and Black Merlin amongst them. Their latest single was a motorik collaboration with Friendly Fires. Andrew Weatherall will also play his Music’s Not For Everyone set. Twice. No one could guess what this will include, as this is an organic set highlighting his love for a world of bizarre, twisted and fucked-up rekkids that he thrives on. Highlights previously have been Fad Gadget, Julian Cope, rockabilly gems and last time out some Modernist obscurities. AR Kane’s “A Love From Outer Space” spawned a monster. Andrew Weatherall’s and Sean Johnston’s inclusive parties across the world have become synonymous with the slo-mo, deep and always original nights that have united the best party people for time. Recent outing at Antwerp Mansions in Manchester included edits of Talking Heads, New Order & Madonna alongside classic and contemporary new acid house chug. They will end Friday evening in significant style, and leave witnesses to argue over what every rekkid was. With such a cosmopolitan musical exploration of the best all of Europe has to offer, The Andrew Weatherall Festival promises once again to be a rare delight. Your summer could just be ending, but this could stave off the imminent UK cold, and fulfil those festival wishes.